In We're Comin' Thru tapestry we see a wall hanging based on the work of artist David Devary. The main focus of Devary's work is cowboy life in the American West. 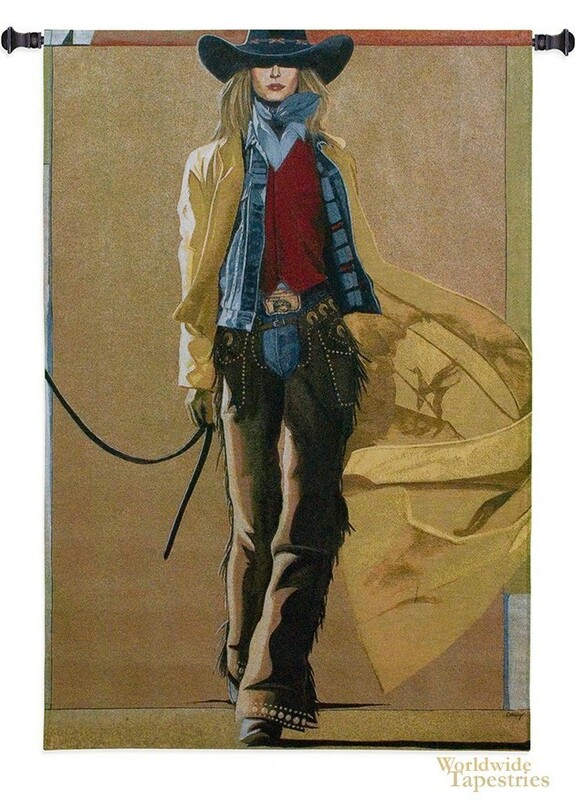 His style is stylized and idealised realism and can be seen in this work which shows a cowgirl coming though in bright attire with attitude. For a sense of color and energy, and fanciful fun, this work will suit any room or home. Having grown up in southern Illinois, Devary is now based in New Mexico. This contemporary tapestry 'We're Comin' Thru' is backed with lining and tunnel for easy hanging. Note: tapestry rod and tassels, where pictured, are not included in the price.